Google Search Console is a very powerful tool for optimising your website. I have found that marketers tend to stick clear of it like the plague and leave it to their IT team. But this is a mistake. The insights that you can gain can dramatically improve the traffic to your website. In this guide, I’ll cover 4 powerful insights that you can pull from Google Search Console reports in minutes. Google Search Console (GSC) is a tool offered by Google free of charge that helps you to monitor and maintain your website performance in search results. You can use GSC to make sure that Google can access your content, what queries your site is ranking or nearly ranking for, which sites are linking to you and much more. 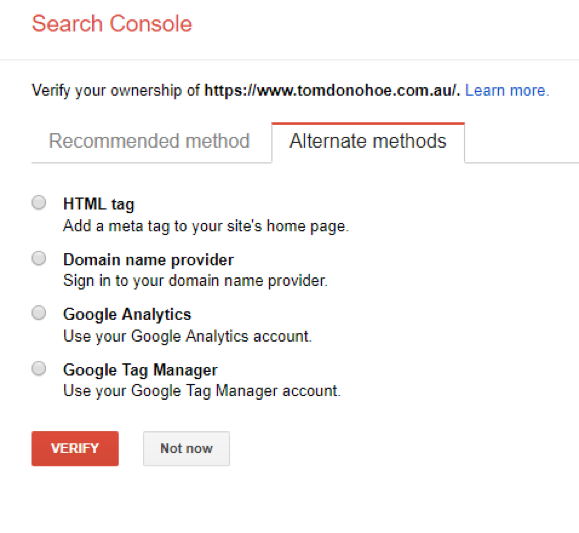 If you are yet to set up Google Search Console for your business follow the guide below. If you have already that’s great! Skip straight to my 5 tips to gain meaningful insights. 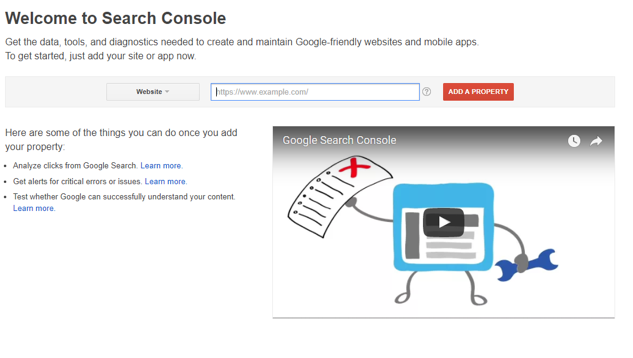 To sign up for GSC, head over to Google Search Console home page. Add your website URL and hit “add property”. You will then be asked to verify you own the website. You have five (5) options to verify your ownership. If you have access to your website’s file manager, such as FTP or cPanel you can download and upload the HTML verification file to your root domain. 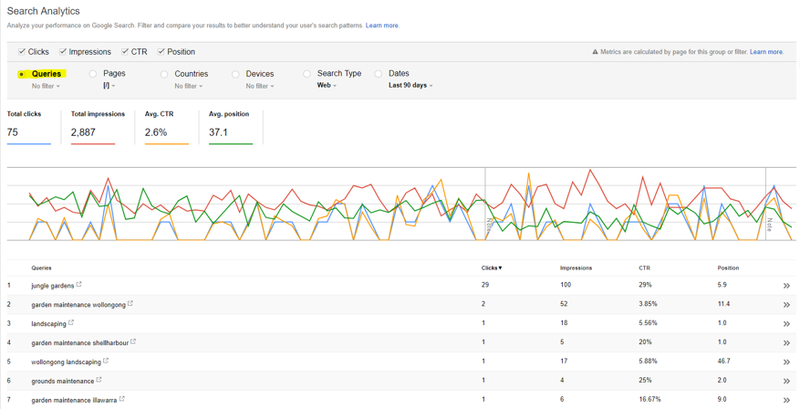 If you successfully verified ownership you should be in the search console dashboard ready to begin gaining insights. 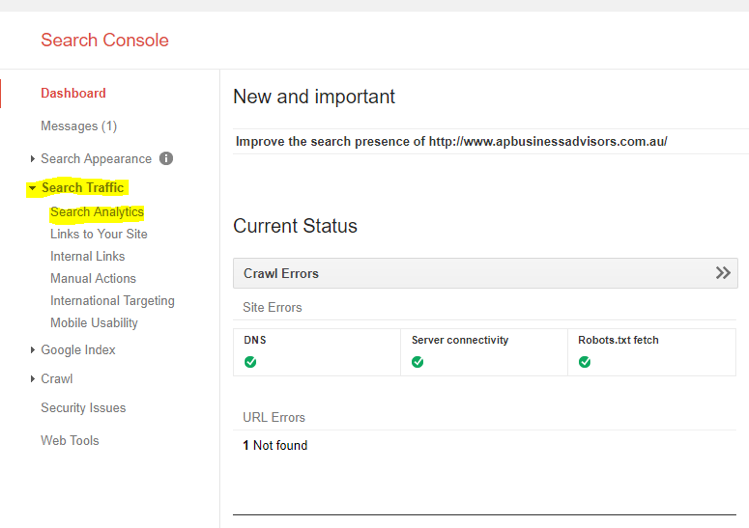 Now you won’t see any data in Google Search Console for a couple of days. 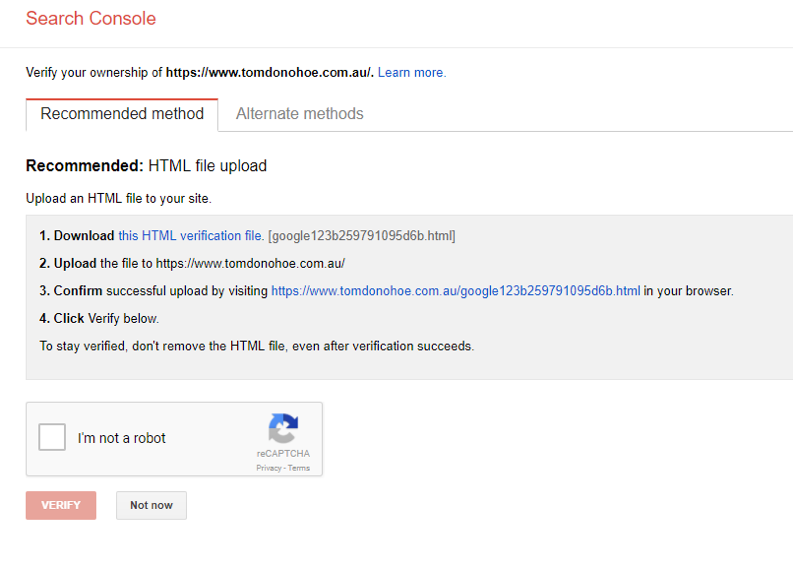 But in the meantime you can submit an XML sitemap to help Google understand your website. Google have a support article on why and how you should do this. When conducting keyword research more often than not we turn to Google Keyword Planner. I highly recommend you still do this. But you can also find a lot of new keywords in GSC. In this report we can see what queries our website is getting impressions from. This is a great way to identify new long tail keyword ideas. What you do with these keyword ideas depends on your SEO strategy but in my next few tips I will give you some advice. This is a very simple yet, powerful optimisation that you can get from GSC. Then tick impressions, ctr and position. Filter by clicks. Pick out your top page. And click the >>. Once you filter by your top page, you will want to filter by queries. Then you will see all the queries that your top page ranks for or nearly ranks for. Identify the queries that have the most impressions and that are most relevant to your business. Look at your pages on-page SEO elements. Does your page title and H1 include these keywords? Are they included in the meta description? Are they mentioned throughout the web pages copy? If not, make these optimisations. You can rinse and repeat this same process but for pages that have a lot of impressions but are not ranking on the first 2-3 pages of Google. When optimising a web page it’s best practice to keep the theme of your page very tight. Usually, only optimising the page for 1-3 keywords. This time you want to look for queries that the page is ranking for that aren’t particularly relevant to the page. Take these queries and create new pages tailored specially to them. Make sure the content is unique and super relevant to your keyword. Finally, if you are writing blogs frequently this is a great tactic but it can also be useful for other web pages. You can to filter by pages and clicks. Look for pages that have below your average CTR. Once you have identified these pages make a note of them. Now you have a list of pages with low CTR, investigate why? Google search the keyword the page ranks for. Look at the other results. Are their meta description more compelling? Test a new meta description but with a stronger call to action or value proposition. If you can get as little as a 5% lift in CTR this can dramatically increase your organic traffic. These 4 tips are very simple and easy to test. But there are many ways you can use Google Search Console to improve your organic rankings. Experiment with the tool and use it to monitor your rankings. Constantly look for trends and opportunities in the data. And most of all take action!